Daily News file photoThe deed-restricted 'affordable housing' homes of the Wellington neighborhood near Breckenridge have not prevented the adjacent market-rate homes from appreciating solidly in value, according to the developer. Recent research indicates there is a shortage of housing for Summit County's workers and the gap between income and home prices continues to grow. In response, local planners have started to identify parcels of land that could be suitable for affordable-housing developments. Real estate experts say there is scant evidence that Summit County’s affordable-housing developments drag down property values in adjacent neighborhoods. 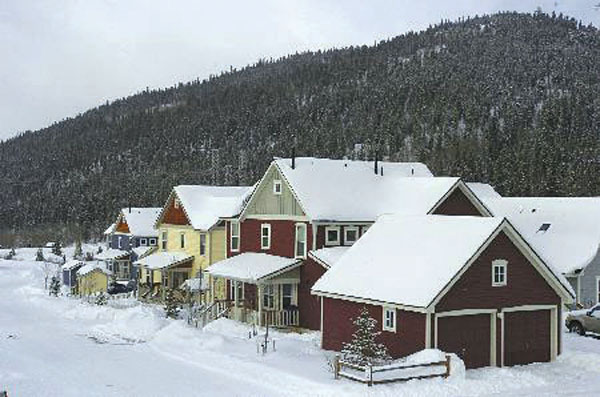 The Ophir Mountain Town homes near the County Commons, for example, have had no negative impact to property values at nearby Bill’s Ranch, according to local appraiser Bob Ebert. Similarly, the deed-restricted units built in the Wellington Neighborhood, at Vista Point and Gibson Heights near Breckenridge have not affected values at nearby high-end subdivisions, Ebert said. Recent research indicates there is a shortage of several thousand units available at prices attainable for Summit County’s workers, and the gap between income and home prices continues to grow. In response, county planners have started to identify parcels of land that could be suitable for affordable-housing developments. Those preliminary plans have once again raised concerns among some property owners that existing home values could be dampened. Arguments that affordable-housing neighborhoods do have negative impacts are mostly intuitive, and while they make sense at some level, there doesn’t seem to be any empirical evidence to back up the claims, experts said. “The reality is, people like lower-density, higher-end neighborhoods,” said one Summit County real estate professional, who asked not to be named out of concern for his business. Most real estate professionals agree that there is a qualitative aspect to the issue. Huge urban-housing complexes in cities, as were developed in past decades, have become blighted areas, and they have had negative impacts on nearby neighborhoods. But for-sale homes, targeted to local workers, are a different matter entirely. In some cases, the “real neighborhood” feel of attainable housing actually may bolster nearby homes. The Wellington neighborhood may be one of the best case studies for looking at the relative values of deed-restricted and market-rate dwellings. The neighborhood has about 160 to 170 homes, and 80 percent are deed-restricted. Neighborhood developer David O’Neill said the market-rate units have consistently appreciated at 7.5 to 8 percent annually up through 2008. “Over the years, our market units are going to appreciate significantly. People want real connections,” O’Neill said. O’Neill said the most important thing is how affordable neighborhoods are conceived and executed. In a best-case scenario, the effect on nearby homes can even be positive, he said. Aspen Mayor Mick Ireland, a longtime affordable-housing advocate, agrees. Pitkin County has a robust affordable-housing program, and no one has ever complained about lack of real estate appreciation in the Roaring Fork Valley. In some cases, Ireland said he’s heard of people coming to Aspen and asking about buying in an affordable-housing area ” without knowing that’s what they’re looking at. “It can make areas safer, with less crime, because it populates a neighborhood,” he said, alluding to the ghost-town vibe of many second-home neighborhoods. That fits in with O’Neill’s model for affordable housing, which is based on the character of the neighborhood. Along with the design, the subsequent management of the neighborhood is also important, he said. That requires a governing mechanism, in the form of a homeowners association, that maintains the homes and the common areas in a desirable condition.